From William Conceição Hering - Agro Castanheiras Ltda. The long apprenticeship at Fazenda Castanheiras demanded a lot of persistence and a lot of work (quite expensive), plus the authentic LOVE to the environment and to the " next ", which resulted the maintenance, for many decades, of a reliable staff. 3 - The phase of effective planting begins in the midst of the eucalyptus sub-forests : a) - " Leiras " are widened very well in the middle of the eucalyptus; b) - During the rainy season they're transplanted in a suitable spacing and the removal of the bags. Nowadays, when we find some open space in the native forest, we choose some large Palmito seedlings in areas where they are too crowded (with a minimum size of 1.5 m). and transplant them on rainy days to the pre-determined sites into previously opened and marked holes in the Native forest. Note that since 1942 (76 years) we grow Cunninghamia for Christmas. Originally the Cunninghamia grew in China. This species adapted perfectly to our Sao Paulo climate. As Christmas trees, these trees are subject to annual regular shearing, and then in December cut to be sold for Christmas (with 1.5m, 2m, 3m 4m, 5 meters high) - Note that we already supplied a 16 meters tree at in the "Fair of Goodness" in Anhembi ) several years ago. These trees have a culturally relevant characteristic: The remaining stump, after the tree was cut, normally produces 5 shoots. Approximately seven months after Christmas, we began the "clearing " operation consisting of the removal of 4 shoots, leaving only the most vigorous one. This operation repeats itself during the subsequent years. We designated it in potuguese as "desbrota" with the intent of creating Cunninghamias-groves. 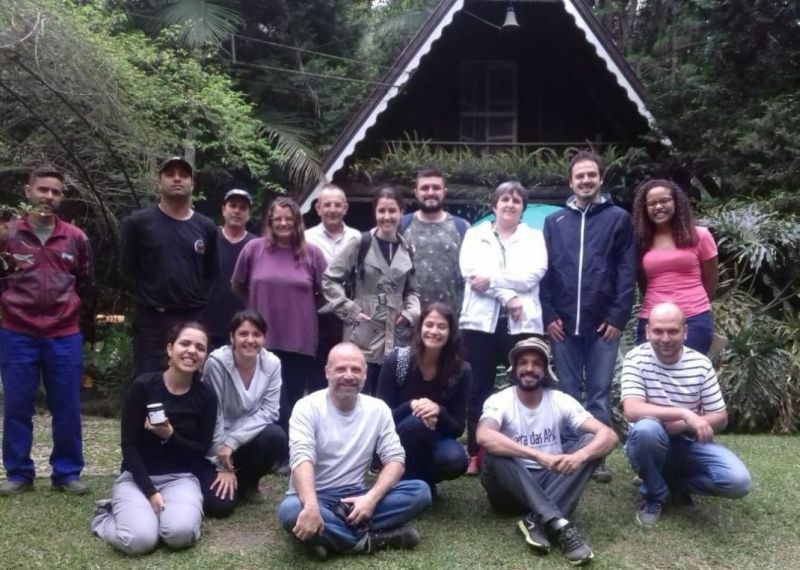 The seedlings of the first planted area in 1942 - now called the "Black Forest" were the product of a "courtesy" of the Cie. Melhoramentos de S.Paulo - Caieiras, in order to encourage us on reforresting. Later on, the seedlings were acquired at the "Horto Florestal de São Paulo" city ("Bairro do Tremembé"). With the expansion of our Cunninghamia plantations, given the limited amount of seedlings available at the "Horto", we contacted a friend in Hong Kong, who provided us seeds, which he brought to California and stored them in the refrigerator. From there I brought them to S. Paulo. The germination of these in our greenhouse was excellent. Interestingly, the same year of the sowing of the Hong Kong-seeds, we discovered seedlings (3 cms) germinating in considerable quantity, in our oldest plantation. It should also be pointed out that our employees are unceasingly committed to the task of creating a " Model Park ", which may serve as a standard for Government offering the community of São Paulo, interested in the true preservation of the green. Having noticed repeated invasions of the area by "hunters", "Palmiteiros" etc. predominantly engaged in the theft of the Palmito Jussara, we built a solid Wall of 2.5m height (plus 3 strands of barbed wire at the top) along the whole extension around the farm ( 5.5Km long ) - built exclusively for the preservation of the vegetation. Our employees are now committed on opening a new parallel track on the west side of the area to allow the movement of the security along the entire perimeter of the property, by motorcycle, auto or tractor. All this, demands a lot of dedication from the Castanheiras team . Every day, even when I am abroad, I get the daily report, in a proper form, of what each employee did, morning and afternoon. This way, I can monitor the progress of the dozens of tasks that I leave weekly written in the hands of my colleagues. On 11-9-2018 I became aware that the carrier along the wall, which connects the "Gate-3 to the Gate-4", located SOUTHWEST of the area, was completed. Regarding the planting of "manaca de Jardim"
Many years ago we found the native "Manacá de Jardim" amid the eucalyptus sub-forests. We transplanted many, to the edge of the Alameda Castanheiras. Few years later, we harvested their seeds which were sown in the greenhouse, in individual bags. Thereafter they were gradually planted along the other internal roads and are object of periodic mowing and pruning. All that demands a lot of labour and guidance. In 1954, in the Horto Florestal, a curious fact occurred. The nurseryman in charge at the time, handed me a native seedling to make an experiment among the Cunninghamias seedlings he provided. It was planted and fully "Forgotten". In 2014 ( 60 years later ), for the very first time, seeds fell from that tree. Only then we realized that it was an immense Guapuruvu, a species in extinction, that was predominantly used for the construction of canoes and also called "FICHEIRA" (in the past they used also such seeds as 'chips' in card games as well as ornaments. All seeds collected from the ground were carefully cultivated in our greenhouse and planted in different points in the Forest Reserve. They did remarkably well ! From then on they integrated our yearly list of native species planted (two annual Hectares) as RPPN-"Volunteer".